The Outdoor Hebrides - An action packed island hopping adventure. Check out the extended video here! When I was asked by the Outer Hebrides to come and have an adventure on their islands I jumped at the chance. Having just completed the Hebridean Way cycle 2 weeks earlier I had glimpsed what they had to offer and I was excited to see more. Being a last minute packer as always, and with a range of activities planned, I threw the essentials into my rucksack from Tiso and tried to ensure I had everything I needed. Now some people may get caught up in having different clothes for every day, but when I am embarking on an outdoors/camping trip I tend to pack less. I always find I generally wear the same clothes and if you are planning on lots of water activities then you'll be in a wetsuit or swimming stuff most of the time anyway. Well that’s how I justify packing less to myself! The forecast was mixed so I made sure I had a few waterproofs and I was ready to go. First port of call was to head to Edinburgh to pick up our camper van from Bunk Campers and to meet my fellow bloggers and instagrammers Neil and Ali who were joining me on the trip. We were given a tour of the van and the boot was packed out with all of our gear before it was time for the drive to Skye, where we were staying for the first night before catching the early morning ferry to Harris. The drive north was stunning as always and we couldn't help but pull in at Sligachan for a quick photo opportunity on the way past. Our first destination was the campsite at Uig ferry terminal on the Isle of Skye. With stunning views over the cliffs of Uig it was the perfect spot to pitch up for the night. After a quick bowl of pasta rustled up in the van, (I definitely need some van cooking tips) I took a walk down to the waterfront and watched the glow of the setting sun reflecting off the cliffs. The sound of the sea and shalders on the shoreline soothes my soul. 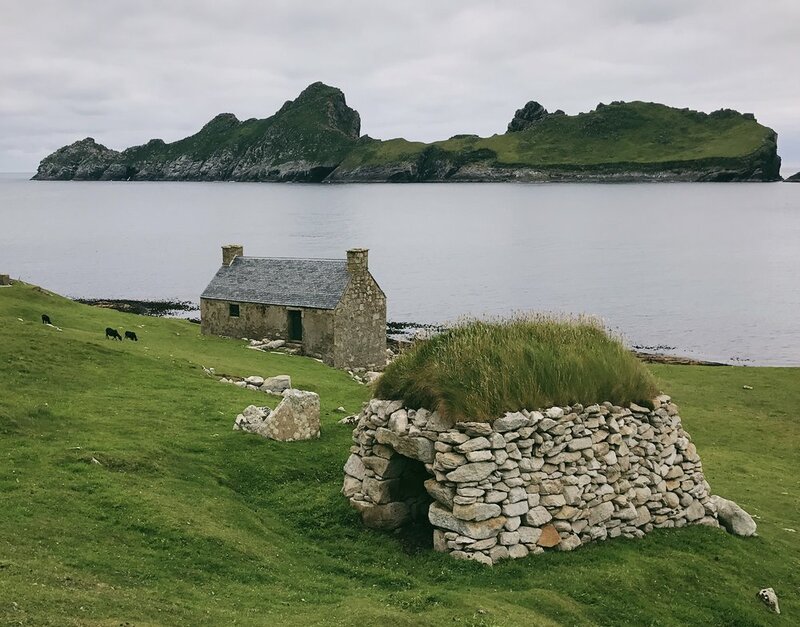 I think being an islander means I am immediately more content when I am by the sea or on an island, so I couldn't wait to spend a week island hopping the Outer Hebrides. The midges soon took me out of my daydream and it was back to the van for a good nights sleep. An early rise and it was time to join the queue for the Calmac ferry from Uig to Tarbert in Harris. Now I may have mentioned this before, but I love Calmac. Not only do they symbolise the west coast Scottish islands, but for me, they symbolise a road trip, an adventure and most importantly, my holidays! Ferry boarded and a full breakfast ordered and devoured before a walk on deck to watch the Isle of Skye fade into the distance. Despite having been on hundreds of Calmac ferries I still get excited by the adventure of it all and I love watching as we sail past the sights with the wind in my hair and the taste of sea spray on my lips. I even love that one car alarm that always seems to go off to kill the ambiance. Maybe Calmac could put a sign up...........DO NOT SET YOUR CAR ALARM! We disembarked at Tarbert in Harris and took the stunning sunny drive over the Clisham before heading for our first adventure of the day at the Scaladale Centre, where we met Kate, the fourth member of our group. Sean and Jen, from the Scaladale Centre were there to greet us and give us our itinerary for the day, which began with some mountain biking followed by coasteering before we pitched up for the night and enjoyed a beach BBQ. Kitted up and safety brief signed, we set off for one of the easier sections of trails. I love cycling, I cycled around Shetland growing up, and as such I would say I was a fairly confident cyclist, having often cycled on tracks and trails. So when I was told we were mountain biking I felt fairly confident that I would be a natural. Little did I realise that so much of mountain biking is putting in some hard work to go uphill in order to get the epic downhills!! A few exhausting cycles up followed by some fairly fast downhills and it is easy to see how people get the bug. Plus, it was nice to try something a bit different after following the roads of the Hebridean Way previously. Mountain biking over we headed back to the vans for some well-deserved lunch before our next activity. The sun was splitting the trees (or should that be peat stacks?) and I was looking forward to jumping into the nearest bit of water I could find. We retraced our route back over the Clisham and headed towards Hushinish beach on the west coast. I knew on the drive along the single-track road, that this place was going to be spectacular. The views were already amazing. Eventually we turned a corner and Hushinish was in front of us. Gorgeous white sand met by turquoise blue water and the best thing about it.........barely a person about. We donned our wetsuits and helmets and plunged into the remarkably mild water, setting off around the coast in the shadow of Scarp, a once uninhabited island off the coast. The water was amazing and Sean and Jen took us to some great spots for scrambling and jumping off. Despite having been coasteering a few times before, I still get a rise of panic when it comes to jumping off higher cliffs, even though I know I will do it. To say I was buzzing afterwards was an understatement. I love being in the water. Dried off with sea salt in my hair and the sun setting meant it was time to pitch our tents before tucking in to the beach BBQ. The food and company was amazing and I can honestly say that at that moment whilst sitting on the beach with the waves crashing on the beach and the amazing glow from the sunset I was completely content. I really do love being Scottish all of the time, but moments like this just cement it for me even more. We stayed on the beach for way too long as the light refused to fade and it was nearly midnight before I finally crawled in my tent. Even at midnight there was still a stunning glow in the sky and I struggled to zip up my tent and shut it out. I wanted to eek out every single second from that day. Early rise at Hushinish, tents packed away and it was time for another action packed day in the Outer Hebrides. Today’s activities where in North Uist and included painting with the amazing Ellis O'Connor, followed by horse riding on the beach, all finished up with a wild swim. This meant another lovely crossing with Calmac before we headed to Baleshare beach to meet with Ellis. I have followed Ellis for years on instagram and have been lucky enough to meet her once previously whilst on the same ferry to Eigg. I have always loved Ellis' art and I feel like since she has made the Outer Hebrides her home, her art has gone from strength to strength and I'm so pleased to see her doing well. We met Ellis on the beach for a masterclass in painting, and her positivity is infectious. Not only was she encouraging and helpful with our poor attempts at painting but her general outlook on life is inspirational. Ellis runs Drawing Workshops where she takes small groups outdoors to show them how she works and is inspired by the landscape and I cannot recommend it enough. Even if you realise you don't have a creative bone in your body, time spent with Ellis is worth it alone. She radiates goodness and inspiration. Next stop was Uist Community Riding School for horse riding along the beach. This has admittedly been on my bucket list for some time, so I was delighted to hear we were doing it on our trip. I have been horse riding a few times and every time I do it I love it even more. Horses are beautiful animals and it seems like such a therapeutic hobby, but with an extensive list of hobbies already I figure this one is better left to day trips with no responsibilities or kit to buy! We set off along Airport beach with the horses requiring little direction. They know this route well and needed zero input from us. It was fascinating to learn from the staff about the different personalities and friendships that each horse has, and how mine, unfortunately was scared of the water, so wouldn't go near it when all the other horses at least got their hooves wet! We slowly made our way back to the stables and it was time to say goodbye to our horses and head for the water once more. The local swimming group, The Hebridean Sea Swimmers had arranged to meet us at the beach and take us for a short dip. The cloud had cleared leaving behind a beautiful soft haze on the horizon and calm seas. Seeing as it was June there was no need for a wetsuit and we took to the water. I love the initial shock of getting into the sea. The water feels cold but not uncomfortable as you walk in, and I love the feeling when you have to take the plunge and submerse yourself in the cold water. It makes every bit of skin tingle, but before long it feels like a warm bath. Whilst the others were content to take a quick dip I opted to take a swim out to a rocky outcrop with the The Hebridean Sea Swimmers. It's amazing to see so many people enjoying wild swimming and I couldn't have met a friendlier bunch. It really was such a joy to spend time with them. I swam back to shore taking in every second I was in the water, it really is good for the soul and looking across the calm water from sea level is one of my favourite views. A quick change and attempts to tame my wild, salty hair failing we headed for dinner before we made our way back to our accommodation for the night at The Wee Haven in Benbecula. Not only is this a luxury camping pod but they also have a yurt and do yoga and massage therapies. The perfect spot to relax after a long, but amazing couple of days. It also meant I could have a long overdue shower and wash all the sea salt out of my hair. The Wee Haven micro lodge was beautiful but I opted to stay in the Yurt having never stayed in one before. With comfortable beds made up on the floor I felt like I was sleeping in a homemade den. The sky was spectacular as I went to sleep with the only thing disturbing me being the occasional midge or moth that had snuck in through the door. Well rested and most importantly clean, we woke to a different landscape in the morning as the fog had set in. I love the eerie silence of fog and I enjoyed our drive south toward Eriskay where we were catching the ferry to Barra for a day of water activities. Unfortunately, the weather had other ideas and due to the fog the first few crossings where cancelled, so what better excuse to go for a walk on the beach. As the fog started to lift the colours of the beach came to life and I was almost disappointed when the ferry appeared on the horizon, cutting short my hopes for a quick dip. Once on Barra we headed to Isle of Barra Surf and Coastal Adventures in Castlebay where the first port of call was snorkelling with seals. Our guide for the day was Andrew from Barra, a local whose passion for his island, the sea and the outdoors is undeniable. I felt like I had met a kindred spirit. We got kitted up and set off across the machair for a snorkel. The water was beautifully calm with the last of the haze still clinging to the water. As soon as you put a snorkel on and dip your face in the water it really feels like you have entered another world. The feeling of the cold water on your face and in your ears with seaweed brushing past your face and skin makes you not want to come back up. There were some seals nearby who seemed cautious initially but as they got used to us they became a bit more curious. Being from Shetland means I am fairly used to seals, but they still fascinate me whenever I see them. Snorkelling over it was time to head back and do some kayaking. I have kayaked several times before and done a bit of island hopping, but since I started paddle boarding I haven't been in a kayak, so I was anxious to see if I still had it. The sky was a bright blue with some cloud still lingering over the hills. I paddled alongside Andrew and we chatted about being islanders and what it meant to us both, realising that no matter what island you are from, there is a sense of belonging that you can't quite put your finger on, and that it immediately gives you a unique bond with fellow islanders. We paddled around Kisimul Castle and enjoyed the views before it was time to head back and catch our ferry to South Uist, stopping to watch a stunning Hebridean sunset en route. Our accommodation for the night was Howmore Hostel, a beautiful traditional blackhouse that now serves the weary traveller looking to stay somewhere a bit different. The accommodation is basic but there is a fantastic kitchen and from what I have heard if you are lucky there may be some home baking on the go on your arrival. After an action packed day I was out like a light after I climbed into my sleeping bag on my top bunk. We woke to the final day of our trip and were met by hazy skies once more. This meant more delays as we tried to get to Harris from Berneray for our final activity of the trip in Lewis. We were off to meet Lewis who runs Hebrides Fish 'n' Trips. I had heard good things about this trip and more importantly Lewis, who runs them. If you have visited Harris Distillery then you will recognise him as the man who collects the sea kelp which they use in Harris Gin. We arrived and met Lewis and immediately I knew we were in for a treat. He has amazing knowledge, passion and love for his home and the area he works. He also has an amazing eye for photography as the photos in his office demonstrate. Further safety brief signed and myself initiated as a temporary crew member and we were off into Loch Erisort. Lewis told us about the local White Tailed Sea Eagles that nested on the Loch and within minutes they appeared. It really was a sight to see. Lewis told us about the wildlife in the area and talked us through his knowledge of seaweed and how he ensures it is sustainable. His passion is spellbinding. We did some fishing and hauled up some creels and then we met Barry the Bonxie. I won't go into too much detail about him but his and Lewis's relationship is very special. I won't say anymore than that, but what I will say is book a trip with Fish 'n' Trips as you won't be disappointed. I am sure there are plenty of companies doing similar trips but the selling point for this one is Lewis himself. We were out on the boat for 3 hours and you could see that for every one of us it was the highlight of the whole trip. Lewis was engaging, funny, knowledgeable and passionate. We were sad when our trip came to an end but we were heading to the Cabarfeidh Hotel in Lewis to enjoy the crab we got earlier from the creels. With a hotel room to myself, I had my second shower of the trip and enjoyed looking not as feral for our last night together. I headed down stairs to the beautiful restaurant where we were served up the delicious crab from earlier along with some scallops and smoked salmon. The food was divine!! Eating seafood on an island is something everyone must try. The freshness and quality is outstanding and it really had been cooked to perfection. BBC Radio Scotland had asked to if I would like to speak about a new tourist scheme which would introduce an Island Passport for people who wanted to visit the islands, and as a keen island bagger myself I was happy to get involved. A 6am alarm call and I was off to the BBC Alba Studio in Stornoway to get involved in the chat. Having never been on radio before I was nervous and excited, but the highlight was being introduced as "Adventurer and all round Outdoors Woman, Bee Leask"! My radio debut complete it was time to head to the ferry terminal to meet the rest of the gang and jump on our final Calmac ferry to Ullapool. As island hopping trips go, I think I can safely say this has been the most action packed. The Outer Hebrides are full of beautiful beaches and turquoise waters, but it is also full of amazing activities and accommodation and most importantly, amazing, friendly people, all with the same thing in common......that they love these islands and they want anyone who visits to fall in love with them too. I certainly know I have. In my self proclaimed ‘year of adventure’ I decided that this was the year I was going to complete the West Highland Way. A popular, well established 96 mile walk through some of Scotlands most iconic scenery. Being such an advocate for Scotland, I was always slightly embarrassed when I met tourists and travellers from abroad who had undertaken it, leaving me red faced when I advised I hadn’t quite gotten around to it yet. With the date booked in the diary and my friend Fiona and her dog Marlow roped in, it was time to visit my sponsor Tiso to collect new kit. All that was left to do was to pack and get organised. Before I knew it the day had arrived and it was time for the off. We jumped on the train to the start point at Milngavie with our rucksacks laden with changes of clothes, head torches, tents and sleeping kit. To say they were heavy was an understatement. But under the bright blue skies we were full of optimism. Loads of people have done the West Highland Way - how hard can it be? We were soon to find out! Our goal for day 1 was Milngvie to Balmaha, Descriped as 20 miles along fairly flat track and a good warm up for the rest of the route. Obligitary starting point pictures taken, we were full of optimism and started our adventure. The path is very clear when you leave Milngavie and ambles alongside a river before going through some farmland. It wasn’t very challenging walking but with heavy rucksacks on our backs it soon began to take its toll. Safe to say we had massively underestimated the walk and hobbling into Drymen we started to realise the mammoth task ahead. The Drymen Inn for lunch was a welcome stop, and they were dog friendly too. Soup and sandwiches and lots of water left us feeling a bit better. But our feet were already sore and tired, nothing that some zinc tape and compeed couldn’t resolve. Boots back on and it was time to get back on route. The walk from Drymen is along forestry type track and through farmland (with lambing sheep in during spring, so it’s important to keep your dog on a short leash). We got caught out with a few small showers but nothing that we couldn’t handle or weren’t prepared for. In what seemed like a lifetime we seen Conic Hill looming ahead of us. A walk up over the back and down the front would take us to our first stop for the night - Balmaha. We took a 5 minute seat at the base of Conic Hill with Marlow sat between us, and laughed about how we had managed to get through the day and how unprepared we might have been had we not been offered some sound advice from staff at Tiso. The sun was starting to set as we reached the top and we decided to skip the short detour to the summit to find our camp spot for the night. We set our tent up just outside the Camping Management zone and ditched our bags, before the 10 minute walk to the Oak Tree Inn for dinner. Dinner was delicious and just what we needed after a very tough first day. But the challenges of the day weren’t over quite yet, on returning to the tent, water had burst from one of the rucksacks and created a small pond in the tent! I just wanted to sleep! Spillage dried it was time to get our heads down. I think I was asleep before my head even hit the pillow. No alarms being set and both being tired from our first day meant we set off a little bit later than planned for day 2. Snacking on cereal bars for breakfast we popped in to the visitor centre where we spent time taping up any blisters and hotspots from the day before before ditching some excess kit. This meant we didn't set off until 11am! Not ideal when you are trying to walk 20 miles in a day with only approximately 12 hours of daylight. Over 4 hours of which we had already wasted. Boots on, cereal bars digested it was time to make progress. The well defined path leads out of Balmaha and follows along the loch side, giving easy walking for most of the way and plenty to look at, including the famous lonely tree at Milarrochy Bay. The path continues on and eventually reached Rowardennan where many people decide to climb Ben Lomond. Given it was already 3pm with the sun due to set about 6.30pm we decided to give it a miss. We stopped in at the Rowardennan Hotel for another lovely lunch and the chance to take a seat. The food was just what we needed and I think Marlow was secretly glad of the break as well. Now I may be wrong, and I'm hopeful that it wasn't just us, but on this walk, every chance you stop is another chance to take your feet out of your boots and let them breath. So that is exactly what we did. Words cannot describe to you how good it feels to take your feet out of heavy boots after a long walk. Break over, it was time to hit the road again. Now we had been given some advice at the start of the walk that after Rowardennan "you will see a shiny new sign that points down to the Loch side, ignore it and follow the upper one through the forest". Well I didn't heed this advice. Not that I didn't want to, just it wasn't until we were miles past the sign that I clicked that that may have been the one I was told about. This section of the walk is hard going, if done as a section on its own then I imagine it is fairly straightforward, but after having already walked several miles it is quite challenging. Lots of ups and down with plenty of tree roots and trip hazards. However it does follow the loch so you have plenty of pretty views to distract you, including the dramatic Cobbler appearing across the water. The route we had chosen eventually meets back up with the upper forestry track and it was at this point I realised how much time could have been shaved off our day! But we had to plod on. The sun had set and we walked our way along the route, hoping we weren't too far from our finishing point. Unfortunately it was now dark, so we had to don our head torches and carry on. I can't really tell you much about the remaining miles to Inversnaid other than it was a relatively narrow, rocky path which seems to be quite high above the loch shores. We passed a few other walkers who were more sensible than us and had set up camp for the night along the route. In the dark with no sense of your end point, the track seemed to go on forever. Feet sore, tired and ready for bed we were delighted when we finally heard the waterfall at Inversnaid. Thankfully I have been here before so I wasn't too bothered about the lack of photo opportunities, I was just glad to know we were finished for the day!! Well rested and with the sun shining we got up early and were on the road just after 8am. It was one of those crisp/cold mornings and the Arrochar Alps looked amazing with their dusting of snow. The West Highland Way follows the shore line once more and given the weather it was a perfect morning. We were both full of optimism and energy for the day ahead as we wandered along the straightforward path. Feral goats watched us from the sidelines and Marlow even tried to make friends with them, not one of his cleverest ideas. About half way along, the track became a bit more interesting with steps and bridges to cross, but being first thing in the day and with the sun shining we didn't really notice it to be too challenging. After almost 3 hours of walking along the loch past Doune Bothy, we reached the head of Loch Lomond. 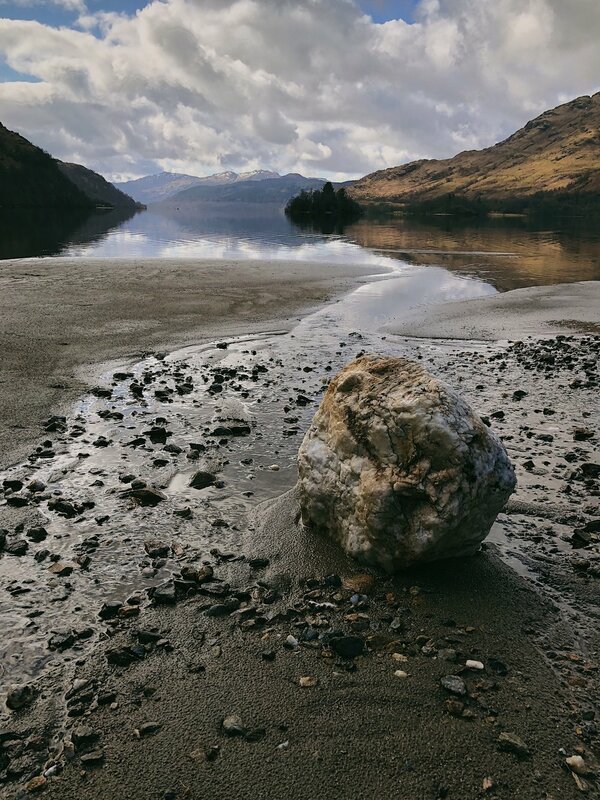 Although it is not a listed milestone on the walk itself, after being alongside Loch Lomond for 2 and a half days meant we had mixed feelings about leaving it. On one hand I was glad to see the back of it, but on the other, it was so familiar now and it was also nice to see it from the other side of the water. Finally it was a short walk up to a lovey viewpoint looking back over Loch Lomond before descending to Inverarnan. We headed to the Drovers Inn for lunch and had massive portions of good stodgy and very tasty food as well as lots of water and juice to keep us going, plus despite the close proximity of other diners........the boots came off again! Like I said, it truly was the best part of any stop! Feet re taped up and boots back on we set off for the next part of our day. The plan was Inverarnan to Tyndrum, which given that I drive this road fairly regularly, didn't cause me any concerns and full of our misguided optimism we set off again. The road sets off along the River Falloch. It is a good clear path and wasn't too challenging, It has some ups and downs but nothing in comparison to the sections at the top of Loch Lomond. It was lovely to walk alongside the river with the epic hills to the right. I always find having a nice view distracts you from any aches and pains. The path eventually crosses to the other side of the road and we walked up to some farm track. There is a lovely section of the West Highland Way here that was repaired a few years ago. Unfortunately the farmer, in his wisdom, seems to have put his cows in this field and they have trampled the path beyond recognition into a mire of sludge and muck. The cows all seemed to congregate at the gate as well which was our only route past, and given we had Marlow with us and the cows had young calves, we had to climb over a wall and trudge around the outskirts before trying to haul ourselves back over on to the path again. We seen other people struggling with the detour as well, who obviously weren't keen on walking through a herd of calving mothers. This detour took us about 30 minutes, which isn't much in the grand scheme of things, but when we were already pushed for time it was the last thing we needed. Back on the clearer path we ploughed on to the crossroads, where we met some lovely tourists also doing the West Highland Way. The road forks here and if you head down the hill it's a quarter mile detour to Crianlarich or you can head up into the forest and on to Tyndrum. It was now 6pm and with out misguided optimism still intact we decided to head on to Tyndrum. Given that when you're in the car it seems like no distance at all, then we figured we may as well just get it done. Decision made we set off up the hill. The track takes you from the beautiful clearing where you can see the surrounding snow topped mountains, into Ewich Forest. Now I have never really been a fan of forests anyways after growing up in fairly treeless Shetland, but after this walk, it was confirmed...........I 100% am not a fan!! The walk started off fairly well, with the track meandering up and down through the forest, and the sound of cars on the nearby road giving comfort that we wouldn't be on this path for long. How wrong we were! Now I'm not sure if it was because we were tired or because we had already had a long day, or because Fiona was struggling with a knee injury, but the going was slow and the track seemed to go deeper and deeper into the forest. Again we passed a few tents along the route, filled with people more sensible, or maybe just more organised than us. But we ploughed on. Both of us were hungry, but we promised ourselves a stop once we got clear of the forest. With the cars still whizzing along close by we just kept hoping we couldn't be far away from where the West Highland Way crosses to the other side of the road. It may have seemed like a lifetime we were in the forest, but looking back it was just 90 minutes!! I put it down to a combination of factors, but now thing I am sure of.........I won't be taking a walk back through that forest again any time soon. We stopped at the viaduct at the end of the forest track before crossing the road, and had a well deserved break. Snacks, water, painkillers and feet taken care of and with the sun already set and the sky getting darker it was time to make our way the final few miless to Tyndrum. We walked the final section in the pitch black once again, but eventually we seen the bright lights of Tyndrum and we knew we were almost done for the day. We decided to pitch our tent at the first campsite we stumbled across, and it was about 10pm before we were all tucked up for the night. All 3 of us were shattered and Marlow looked like he couldn't wait to sleep for the night either. Tent pitched, and day 3 done it was time to call it a night. We woke to the sound of rain on our tent, and despite our best efforts of just lying a little bit longer in the hope that it went off, it didn't happen. Reluctantly we got up and packed away our limited belongings and tent, which is never as fun in the rain, and donned our wet weather gear before setting off. We decided to head for the nearest hotel for breakfast, a must, given that we had missed dinner the night before. We made our way the short distance to the Tyndrum Hotel, which was serving breakfast and was dog friendly too. Due to the heavy rain we were already soaked through, and our waterproofs were working hard. Despite only having them on for a short time, breakfast was the perfect excuse to get all of our wet gear off and dry out whilst having a full Scottish fry up. Just what we needed to set us up for the day. Stomachs full and gear dried off on the various heaters in the hotel, it was time to get wrapped up and head back out. We discussed our options for the day and where we planned to stop for the night. Given the long days we had done since the start and with Fiona's injury becoming a cause for concern, we decided on a more "relaxing day" and agreed to walk the short distance of 7 miles to the Bridge of Orchy Hotel for lunch before we reassessed. The rain was tipping down when we set off at the back of 11am from the Tyndrum Hotel. We walked up the small hill behind Tyndrum and headed towards the epic hills of Bridge of Orchy. The going was straightforward and despite the miserable weather our spirits were relatively high. Unfortunately going downhill caused major pain to Fionas already sore and taped up knee, and we paused in a sheep creep to discuss if she was able to continue. Thankfully she was and using walking sticks more like crutches we continued down to the glen. The cloud obscured any views of Ben Dorain, which is normally a dominant hill along this part of the trail, but it was shrouded with cloud. However it didn't dampen our spirits and we plodded on along the fairly straightforward path which didn't have many ups and downs and snaked around the sides of the epic hills around us. Due to the thick cloud and heavy rain, it was difficult to see how far we had came of where the path ended. The track started to follow the the railway line, with the path getting ever closer to it, so we knew we must be near the Bridge of Orchy train station. Thankfully the station came into view and we knew before long we would be sitting in the hotel bar with a hot drink and out of our wet weather gear. We hobbled down to the hotel and immediately got out of our wet stuff and placed it on every available heater before ordering plenty of water, tea and bowls of soup. We were cold and wet and tired and were glad of the heat and the break. Feeling tired and achy we decided to make it a shorter day and opted to end our day at Inveroran which at only another 2.3 miles away would make this our shortest day to date. We met some fellow West Highland Wayers in the hotel bar and enjoyed our extended break whilst having a laugh over our warm bowls of soup. It was nice to hear that everyone had the same aches and pains and moans as us. It gave us some comfort in how we were feeling. Stomachs full and spirits lifted with the banter we decided we better make a move and head on to our final stop of the day. We left the hotel after 6pm and made our way over the bridge. After a short distance we were back on the track which takes you up through a small forest before opening up to a viewpoint which gives amazing views over the Loch Tulla and the surrounding hills and shows the lonely Inverornan Hotel nestled solitarily in the glen. Given the challenges the previous days had held, we were glad to see the end in sight, and in daylight as well. A first for us on this trip!! We wandered down to the hotel belting out power ballads as had become customary on our walk. It lifted our spirits and distracted us from any pain we were in. Despite it only being 2 hours since we left the Bridge of Orchy and not really being hungry we headed in for another bowl of soup and ended up having more chat with fellow walkers. Before long our hopes of an early night were long gone and we yet again ended up pitching our tent in the dark. Relaxed and feeling positive we set our alarms early and got our heads down for the night. Realising we had to get up earlier if we wanted to avoid walking in the dark, we were up and having an early breakfast of porridge pots and cereal bars before setting off just after 8am. It was one of those beautiful crisp/cold days with soft skies and we were excited to be heading towards Glencoe. Despite never having walked this route before, we were both looking forward to being somewhere so familiar to us and also meant we were a day closer to finishing. We walked past a few tents en route, but none we recognised as anyone we had seen on the walk. 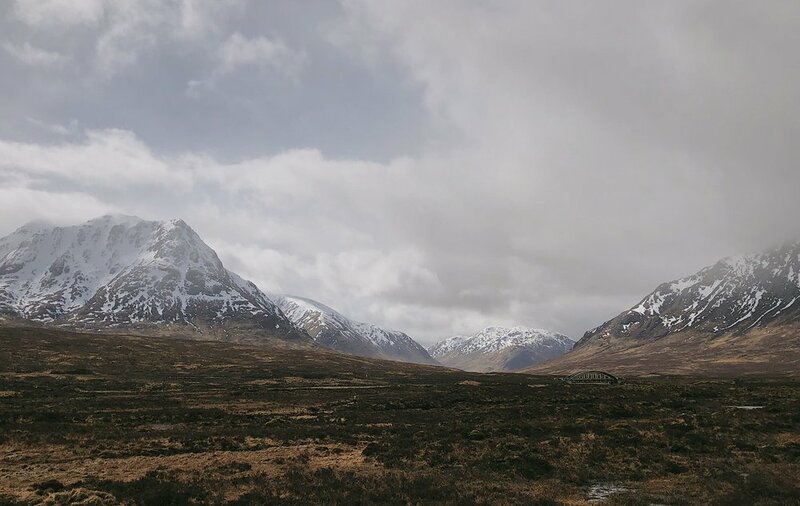 Given the time of year, the West Highland Way wasn't quite full of people as it is in the summer months, and due to this we had struck up friendships with the handful of people who were walking it at this time of year. We would pass them, then they would pass us, but inevitably we always ending up at the same starting and finishing point. It was good camaraderie and was always nice to bump into everyone at the end of the day and share stories of our mishaps. 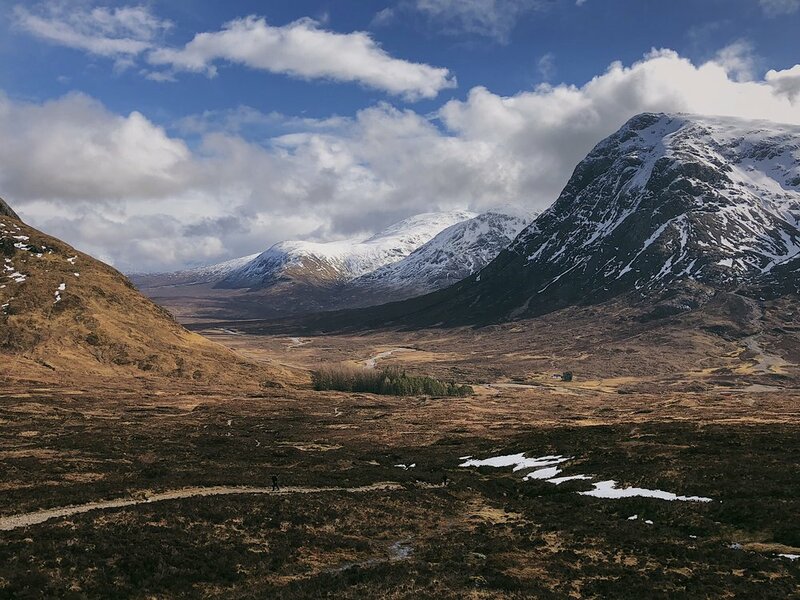 Not long after setting off we reached the Drove Road to Glencoe, initially heading through the forest, it eventually opened up to the beautiful Rannoch Moor which was made even more incredible given the snow capped hills surrounding it. The track is fairly straightforward from here and leads along parallel to the A82 road which runs the length of Glen Coe. After about 3 hours of walking, Buachaille Etvie Mor began to appear on the horizon. It was a welcome sight as we knew we weren't far from our self designated 'half way point'. The path leads you further down towards the ski centre and a short detour here would take you to the Mountain Cafe for a well deserved break. In our wisdom we decided to crack on, thinking Kinlochleven was just a short, hop, skip and a jump over the infamous Devils Staircase. A few pictures taken at Black Rock Cottage we spotted a storm heading our way down the glen, so we took the opportunity to quickly get kitted up and put on some extra layers and waterproofs. We couldn't have timed it better.......as soon as we were sorted the heavens opened. Not just with rain, an actual blizzard. We ploughed on to the Kingshouse Hotel, or what was left of it. Due to some regeneration, it was all but a building site. Such a shame as it would have been a welcome stop given the weather. The weather eased for about 2 minutes and then it was back with full force again. It was a total whiteout with the snow coming in sideways. This meant it was time to get our heads down and stride it out and time for Marlow to go into his rucksack to keep him warm. The weather continued for what seemed like a lifetime, but thankfully before we reached the foot of the Buachaille it had stopped completely and the sun was shining once more. We paused on the bench in the car park and had some food and water before we took on the Devils Staircase. Now in almost every walk report for the West Highland Way, the Devils Staircase makes an appearance as some torturous hill to be endured and one of the toughest parts of the walk. So we were slightly apprehensive as we set off. Now I am not sure if it is because I'm used to climbing munros or because it has been built up to something epic in everything I had read, but I found it to be relatively straightforward. The path zig zags up, which eased the gradient, and the views behind to Buachaille Etvie Mor were enough to keep us distracted. Before we knew it we were at the top, and at 550 metres it was also the highest point of the walk. It had only taken us 45 minutes, so we were excited at the prospect of yet again being finished early. We just had the short walk to Kinlochleven to go, so should be done in no time! This was another moment of misguided and misinformed optimism. Now I'm not sure why every guide talks about the Devils Staircase and seem to omit the next part of the journey, but the descent to Kinlochleven is the real hell they should be telling you about. So let me enlighten you.........the descent is a good track which leads down into the Glen, after only a short time you can even see Kinlochleven nestled in between the hills. It looks so close and it falsely gives you hope that you will reach it in no time! You won't!! The walk down goes on and on and on and on and on and on. You get the idea. It makes you want to go uphill again, just to ease the pressure off your legs and knees. Given Fiona was suffering a knee injury as well, it just seemed to make it worse, but she was a trouper and carried on with her crutch style waking sticks. Our feet were sore and our backs achy and we were tired and hungry. We decided not to stop for a break, as Kinlochleven seemed, "just around the corner" every time and we just wanted it done!! After what seemed like a lifetime of seeing Kinlochleven and umpteen twists and turns in the road we eventually hobbled into the village just after 6pm. It had taken us the best part of 3 hours and we had felt EVERY. SINGLE. MINUTE! I managed to capture a snap shot of our faces when we arrived and it couldn't have summed it up better. We were planning on pitching our tent in the first campsite we stumbled across but being cold, wet and tired and our waterproofs still being soaked from the snow earlier, we opted for a camping pod in order that we could try and dry out some of our kit. It was such a relief to not have to pitch a tent and unpack bags. We quickly changed into our flip flops (a must for this walk) and set off for some dinner. We headed into the only chippie in the village and had the best food of the trip, possibly even the best chippie of my life. I ordered a pizza crunch supper with curry sauce and Fiona had the fish and chips, all washed down with cans of Irn Bru. Absolute perfection. Now I'm not sure if the women serving felt sorry for us, but the portions were huge. We sat and enjoyed our diner before heading back to our pod for a well earned sleep with heating. Only 1 more day to go!!! We woke to a beautiful morning in Kinlochleven. The sun was shining. We were warm and we had slept well. Our feet were swollen and sore and and taping them up and putting on our boots had almost become a welcome relief from the pain. We set off after 9am and headed along the road to the hill climb out of the village. Again this is steep but given what we had endured yesterday it was a welcome change and yet again the views at the top made it worth it. The path soon levels out and you are on the Lairigmor road. The path is excellent walking and meanders through the glen with big hulks of hills on either side. It really is a fantastic part of the walk. After about an hour you walk past the infamous ruin of Lairigmor and you can only imagine what life must have been like living here through cold, harsh winters. Stob Ban rises impressively behind the ruin as you pass. After another hour of walking and with the sun still shining we took a short break for some snacks and to just take it all in. Our feet were holding up well and we were beginning to feel almost comfortable in our boots. Before we knew it we were staring at the massive hulk of Ben Nevis on the horizon. The feeling of happiness that the end was in sight was amazing!! But we still had a good way to go, well 5 miles to be exact. The path continues fairly easily along some forest tracks with a few ups and downs but nothing that proved difficult or challenging. We even seen some eagles hovering above. Its the little things that keep you entertained! Finally we reached the main track into Glen Nevis and it was all down hill from here. Ben Nevis looms overhead and I applaud people who go on to tackle it on their last day. This time it wasn't for us! It didn't take us long to reach Glen Nevis and then we just had the short section of footpath to cover before we reached the centre of Fort William. Now I'm not sure if its because we now no longer had any pretty views to distract us or that it was a busy bit of road, but this definitely was my least favourite part of the walk. I felt every single footstep on that path, and every single step hurt!! But we were near the end, so it was just a matter of putting one foot in front of the other. Eventually we reached the original finish to the West Highland Way and knew we were just a short walk through the town centre to the finish. Finally the Sore Feet monument was in front of us and at 4.30pm on Thursday 29th March 2018, me, Fiona and Marlow completed the West Highland Way. What followed was hugs and high fives and plenty of pictures at the finish line!! It had been a tough few days but full of laughs, power ballads and camaraderie that words can't really do justice. I highly recommend doing the West Highland Way, but I also recommend you do some training, plan well and be prepared. Three things we didn't do, but we enjoyed, almost, every second nonetheless. So what better way to start than to share with you my five favourite islands in Scotland. Now don’t be surprised or horrified, but the Isle of Skye DOES NOT feature in this blog post. Not that it isn't amazing, but Scotland has sooooo much more to offer. Commonly known as part of the Slate Isles, Easdale is an island off the coast of the Isle of Seil and Ellenabeich is a small village on the Isle of Seil which is separated from Easdale by a narrow channel. Confused yet? Well sometimes people refer to Ellenabeich as Easdale due to its proximity to Easdale Island! Either way it is a stunning location. Climb the small hill behind Ellenabeich for stunning views over Luing, Scarba, Mull and Easdale Island, and pop into The Oyster Bar for a wee drink and a bite to eat. Then head over to the ferry terminal (dont forget to press the buzzer to request the ferry) and head over to Easdale. No cars are permitted on the island, so instead the locals use wheelbarrows to transport shopping etc, and you will notice them lined up as you get off the ferry. Wander around the many flooded quarrys, or maybe even go for a quick dip in one of them, before a short climb to the highest point on the island. At only 124ft, what it lacks in height it makes up for in views. And the best bit is, you will probably get to enjoy the views alone. St Kilda is in fairness an archipelago, but if I listed Hirta at number 4 would you know where I was talking about? St Kilda is a collection of islands and sea stacks. The most commonly known being Hirta, Stac Lee and Stac an Armin. Hirta is the island that people land on when they say they are off to St Kilda and it is the site of The Village. The Village is where most, if not all of the population of the island lived until they requested evacuation in the 1930's. 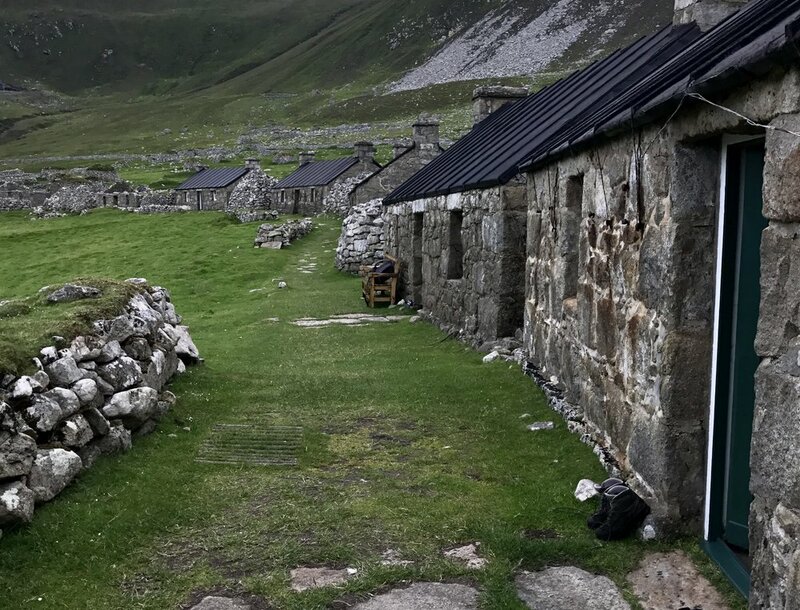 Since then St Kilda has been a popular location for many who enjoy the eerie romanticism of what it must have been like to live and work on such a remote archipelago all those years ago. When visiting, a walk around the village is a must, you get a real sense of how life was through the amazing upkeep of the National Trust for Scotland and Scottish National Heritage. 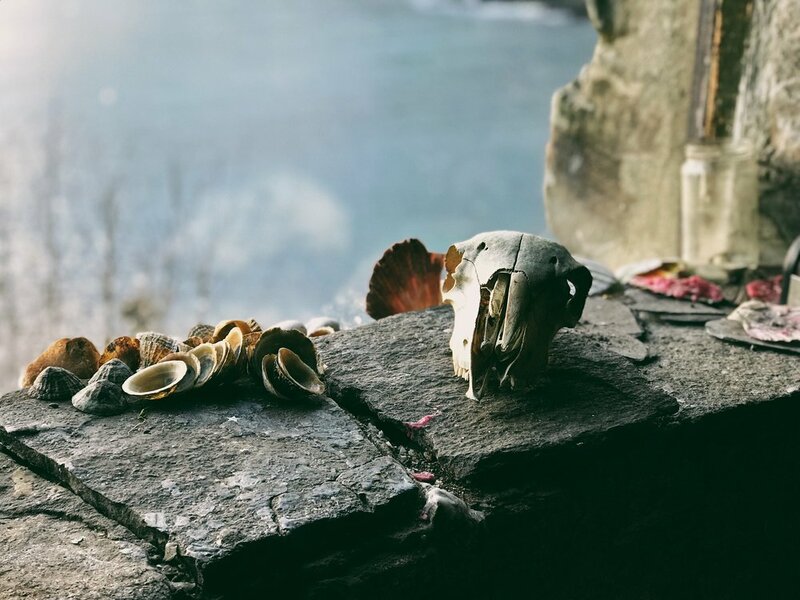 If you are feeling more adventurous and energetic, then take a walk to The Gap, it is behind the village and what looks like a continuous walk uphill drops away into a dramatic cliff edge with stunning views onto Boreray (another island within the archipelago). And for the really energetic amongst you then continue up the sea cliff towards Conachair, at 430 metres it is the hightest point of St Kilda and the views are breathtaking. After taking it all in head back down for another walk around the village and to admire the native Soay and Boreray sheep before taking a dip in the Village Bay. This really is a spectacular island and worth every effort it takes to get there. A hidden gem of an island and not one that gets enough credit in my opinion. I first visited Colonsay 4 years ago in February. It was meant to be a 1 night stay before taking the onward journey to Islay in my quest to visit all of the islands. Unfortunately the ferry got cancelled due to high winds and my one night stay turned into 3. Almost immediately I realised it was a blessing in disguise as the hospitality of the islanders was amazing. From the ferryman to the shopkeeper, they made sure I had somewhere to stay and food to eat. I think I must have been the only person visiting in winter, as everyone else was a local. Scottish islands are at their best out of season, empty beaches, big waves and strong winds make for dramatic views at every turn. I have since been back to Colonsay on 2 other occasions, both times for the music festival 'Ceol Cholas'. Yup - I bet you didn't realise Colonsay has its very own music festival, but it does and it is amazing. I was lucky enough to see Breabach, Blazin Fiddles and loads more amazing musicians. The beaches are breathtaking, from the most popular of Kiloran Bay to Balnahard at the northern most tip of the island. 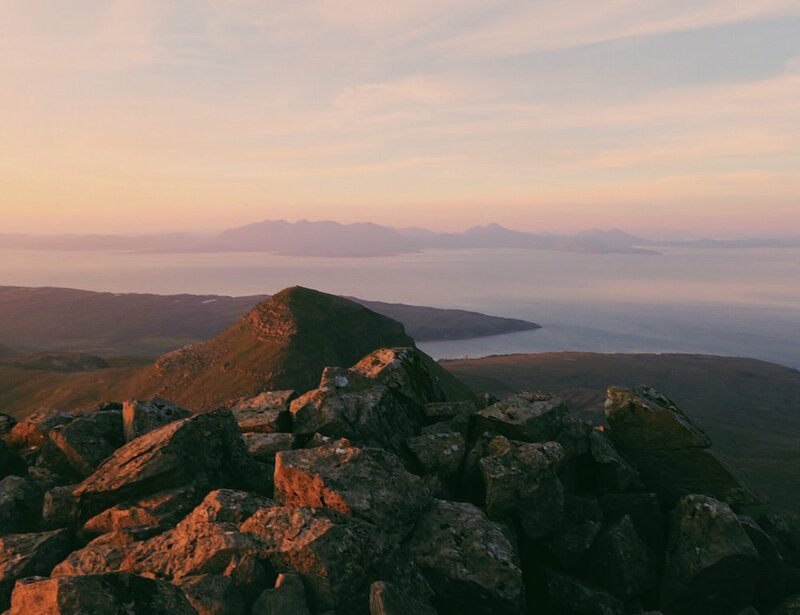 A relatively quick walk to the hightest point on the island, Carnan Eoin at only 143m gives spectacular views towards Jura, Kiloran Bay and the north of the island. Keep your eyes peeled for the whale made out of stones in the fields below. This was a very, very, very close 2nd, and had I not been from Shetland then it may have well pipped it to the post. Where to begin with Rum. I love everything about this island. I can remember the first time I set eyes on it during a trip to Ardnamurchan Lighthouse, and I knew right then that I had to visit. Rum has everything!! Dramatic coastline, stunning castle, breathtaking hills, bothys, wild deer, Rum ponies and the most amazing beaches. The Rum Cuillin cover the 5 major summits on Rum which include 2 corbetts and a graham, but don't be tricked into thinking it's an easy walk. Taking 12 hours and a descent in the dark means it is not for the faint hearted or the inexperienced. I was lucky enough to watch the sunset from the highest point on the island, Askival and it is something I will never forget. Knowing you are the only people on the hills in such a remote place is incredibly special. If the hills are too big an ask, then take a walk or cycle to Kilmory Bay, there is unlikely to be anyone else around and the views onto the Skye Cuillin are something else. In other words it is the perfect place for a skinny dip, which is exactly what I did. And if even that is too much, then take a short walk from the ferry terminal to Kinloch Castle and enjoy one of the tours, given by an islander. The castle is so out of place and the history is so quirky and scandalous that it alone makes a visit to Rum worth it. I grew up in the North Mainland, with a sea view which watched the Yell ferry go back and forth all day, well apart from on the really windy days. Now where to begin with Shetland? It is made up of lots of different islands all with their own uniqueness and charm. It has the most northerly everything! Most northerly point, most northerly beach, most northerly fish and chip shop. Pretty much anything is the most northerly of anything in Shetland. However it is not for the tree lovers, Shetland is known for not having many trees, it does have some, but if you prefer lenghty forest walks then maybe Shetland isn't for you. However, if you love wild and windy spectacular coastal walks, then Shetland definitely is for you. In fairness Shetland has something for most people. We have amazing culture, history, music, knitwear, artists, festivals and food but better than any of that are the people. Friendly and helpful to a fault. You will never be stuck in Shetland, the locals will make sure of it. Visit Mousa Broch, visit Muckle Flugga, see the Mirrie Dancers (Northern Lights to those who don't speak the dialect), or experience Up Helly Aa, stay in an actual lighthouse, get some chips from the most northerly chippie or just wander around Lerwick and enjoy the shops and some food at the Peerie Shop Cafe. Shetland is remote and seems somewhat challenging to get to, but that all just adds to its charm. The unplanned and unexpected trips are often the most fun in my experience. This was certainly the case for my first paddle boarding and bothy adventure. A last minute plan was hastily thrown together which involved being packed and ready early in the morning! Mornings are not my strong point, either is decison making. So deciding what to pack often becomes a mammoth task, despite having packed for plenty of trips before. Bags packed, phone batteries charged, wetsuits dry and fuel in the car, it was time to undertake the drive north. We arrived at our destination and with wetsuits and warm clothes donned, we grabbed the paddle boards and we were on our way (this sounds like it only took minutes, when in reality, there was lots of running around, changing, pumping up paddle boards, removing kit we didn't need, adding in kit we might and generally lots of procrastination). However the water was idylic and everyone was keen to get going. I had no idea where we were going. All I knew was that we were headed for a unknown bothy, one which prides itself on its secrecy. As soon as I got onto the water, the early start, the indecisiveness and the cold all but disappear into a distant memory. I swear I can actually feel the stresses of everyday life and work just fade away when I’m on a trip. The water was so calm and mirror like which made it easy to glide through and take in the views. After a short 4k paddle we turned a corner and hidden on a rocky outcrop was our home for the night. Even from the shoreline it looked tiny, but absolutely perfect. We dragged our boards out of the water and humphed our kit up a short scramble, assisted by a thoughtfully placed piece of rope, to be met by the most spectacular view of our home for the night. Our bothy was perched on an amazing viewpoint, framed perfectly by a smattering of trees, with the most stunning vistas back over the water. The view from inside the bothy did not disappoint either. A large window taking up the majority of the front wall meant we had a great vantage point as the snow swept over the outlying peninsula, before landing firmly on the doorstep of our bothy. With the door ajar, the snow blasted in, as the sky and sea turned a moody kind of blue. 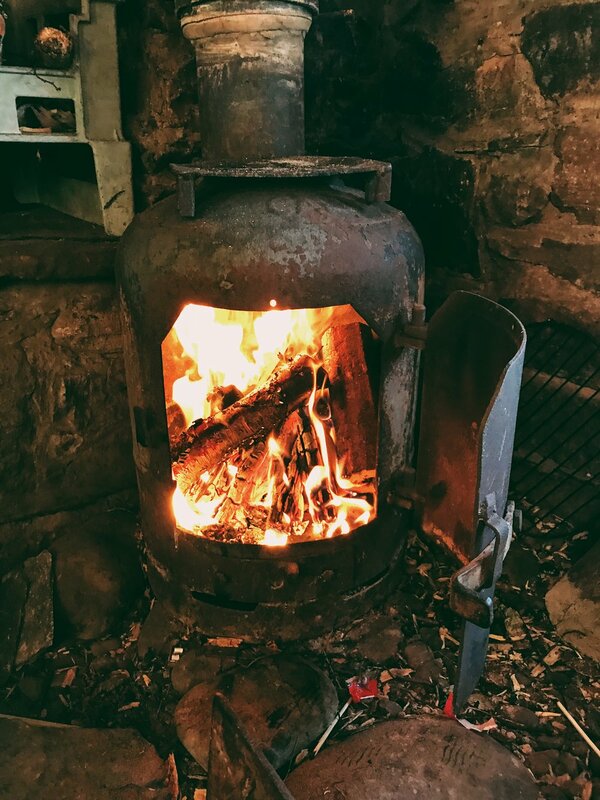 Thankfully we had brought plenty of kindling and wood and so we lit the fire and soon our bothy turned into a cosy little haven. As the saying goes, "if you dont like the weather in Scotland, then wait 10 minutes and it will change". Well, it couldnt have been more accurate for this trip. Within minutes of the snow storm passing it turned into the most gorgous evening, just in time for sunset. With the fire lit, kit unpacked and the feeling coming back into our hands, it was time to take in the views. Sunset watched, paddle boards stowed away from the impending winds and the fire topped up meant it was time to relax and enjoy a wee cup of tea to keep the chill at bay. Dinner was an interesting array of delicacies, from coq au vin, dehydrated food, chilli and the classic - Kraft Cheesy pasta, which for some reason tasted even better from my trusty Jetboil. Time passes so quickly on these trips and before you know it, it’s nearly time for bed. But not before we all stepped out the cosy confines of the bothy to look up at the stars. Despite growing up in Shetland and seeing clear starry skies most of the time, it still always amazes me when you look up at a clear sky in Scotland and see what seems like every single star in the sky. It really is breathtaking and you almost forget the bitter cold while you stand in awe looking up. Finally it was time to blow up the sleeping mats, unfurl the sleeping bags and throw another log on the fire before we all settled down for the night. Safe to say I slept like a baby, and our home for the night was still remarkably cosy in the morning with the wind howling around us. Quick cups of tea made, kit packed up and bothy cleaned it was time to head out onto the choppy sea and make our way home. The conditions were totally different to the previous day and we were all glad when our destination came into view. Paddle boards quickly packed up, heating on in the cars and it was time to head home. Sometimes it can be tempting to sit on the couch if you’ve no plans, but actually making the last minute decision to do something can be more rewarding and less stressful. You have no time to overthink the weather or what to pack, and the experience if nothing else is always worth it. It may have only been 24 hours, but what it lacked in time it made up for in memories.